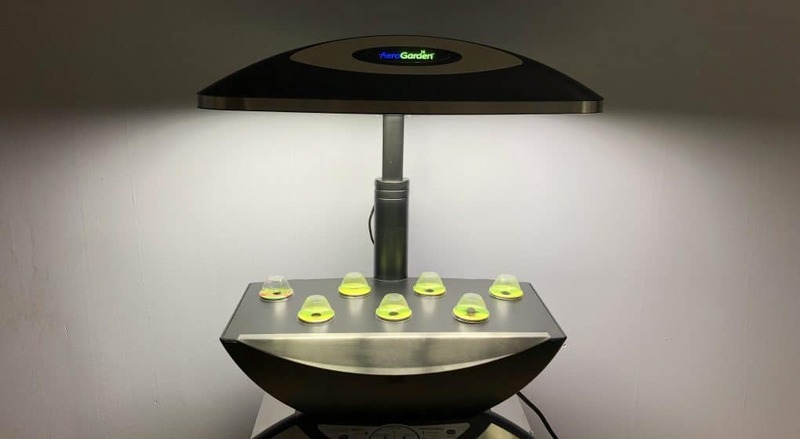 The AeroGarden is an indoor hydroponic growing system designed for productivity and ease of use. It comes in 3, 6, & 9-pod sizes, all with LED lighting. 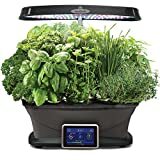 High tech features like a touchscreen and WiFi drive up the price but aren’t necessary for a lush indoor herb garden. Save with our recommendations below. I’m always looking for ways to grow more plants. There’s no such thing as “too much greenery” at my house. I also lean heavily towards plants that can be eaten at some point. I love my organic vegetable garden, but in the northeastern US, we live in a climate where there is a very distinct growing season and the rest of the year you’re out in the cold—literally. 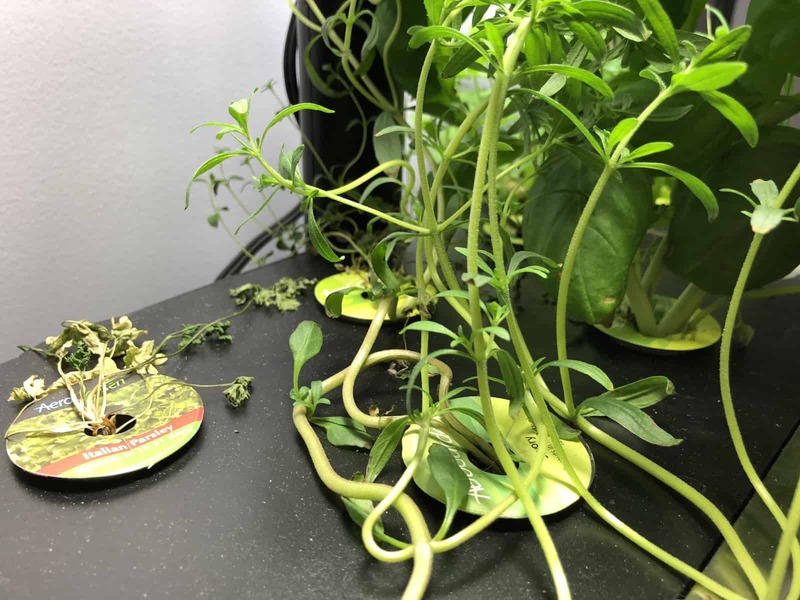 I started looking for easy ways to grow indoors in the off months that didn’t involve major hydroponic or aquaponic set-ups. You know, something without 2x4s and PVC piping that my wife wouldn’t mind looking at for months on end. 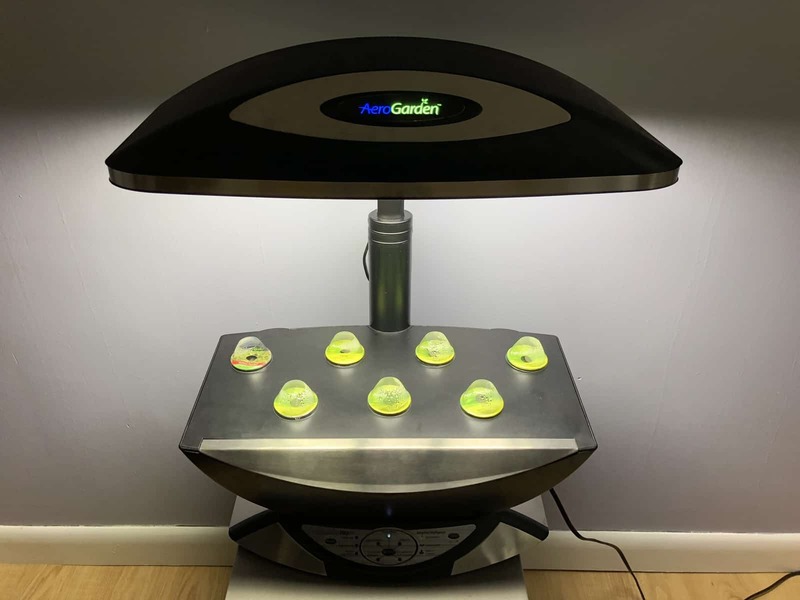 I decided to try the AeroGarden system from Miracle-Gro. It’s basically a compact hydroponic system that can look anywhere from acceptable to downright lovely depending on which version you choose. 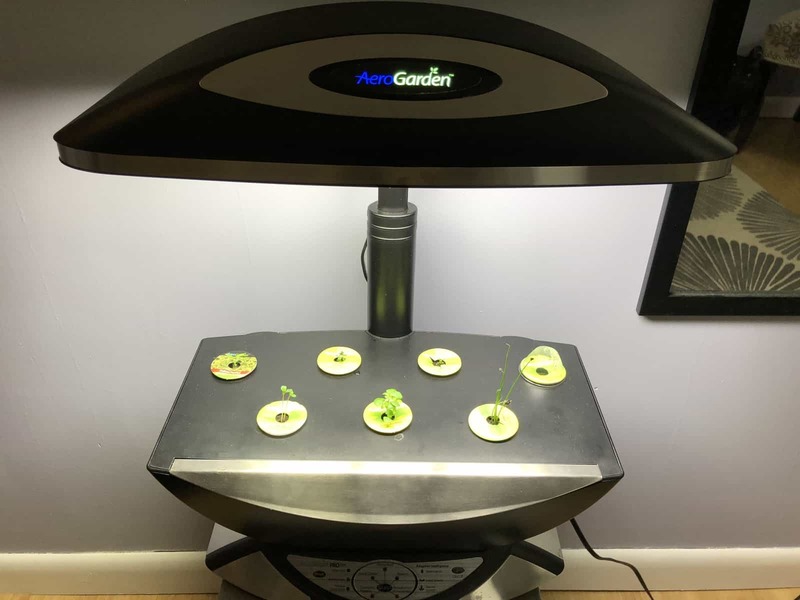 The one I tried was given to me (not by the manufacturer), which is an AeroGarden Pro 200 with 7 pod locations. I think it’s a very nice looking unit, but they don’t appear to make it any longer. The major difference between this one and the newer units seems to be fancier electronics and LED lighting as opposed to fluorescent lights. The latter difference is probably a substantial one for both the cost of operation and sustainability. LED lights are just far less expensive to run and last much longer than the bulbs I used. 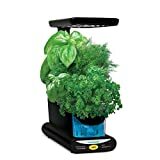 At the outset, I want to give you a quick rundown of the advantages and drawbacks of the AeroGarden. Below you can see how I started out. I set it up on an ottoman to make it easy to access and it looks like a nice piece of high tech furniture in my office, giving off a pleasant glow. In retrospect, I probably had the lights set too high to start. They should probably be on the lowest setting that puts them closest to the seed pods to begin. I used a selection of different herbs that were supposed to take 7-21 days to sprout. Sure enough, just a week later and we’re already seeing a few sprouts! I have two young children and this process was pretty exciting for them to watch. It was very hard for them not to touch the pods, but they really got a kick out of seeing new plants grow like this. 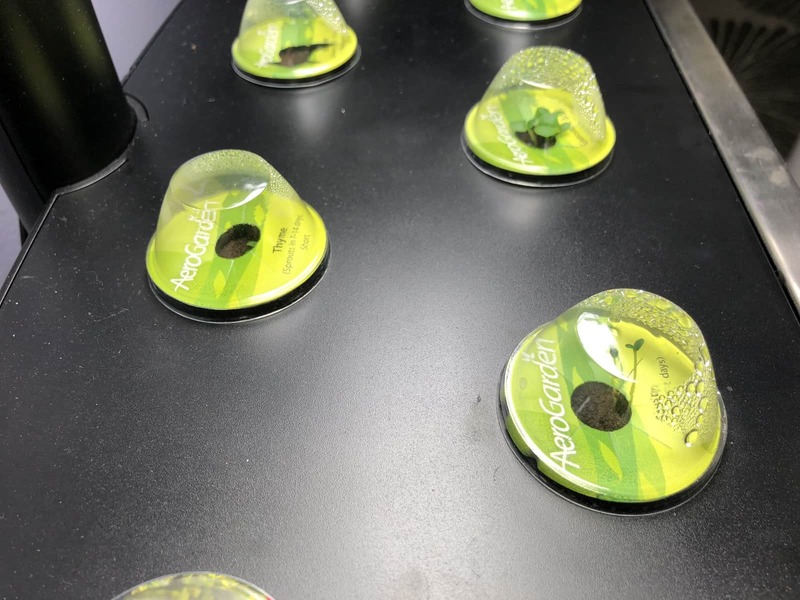 Each pod has a plastic cap that acts as a little greenhouse. You keep it on until the sprout touches it, then you toss them. The close-up pic above shows that the parsley looked odd, white, and fuzzy, like there was mold on the plant. You should probably toss the pod if you see this, for reasons you’ll see below. At this point, we’re starting to see some action. The basil is off to a good start and the chives are shooting straight for the light. The caps are now off on all but one of the pods and that is by design. 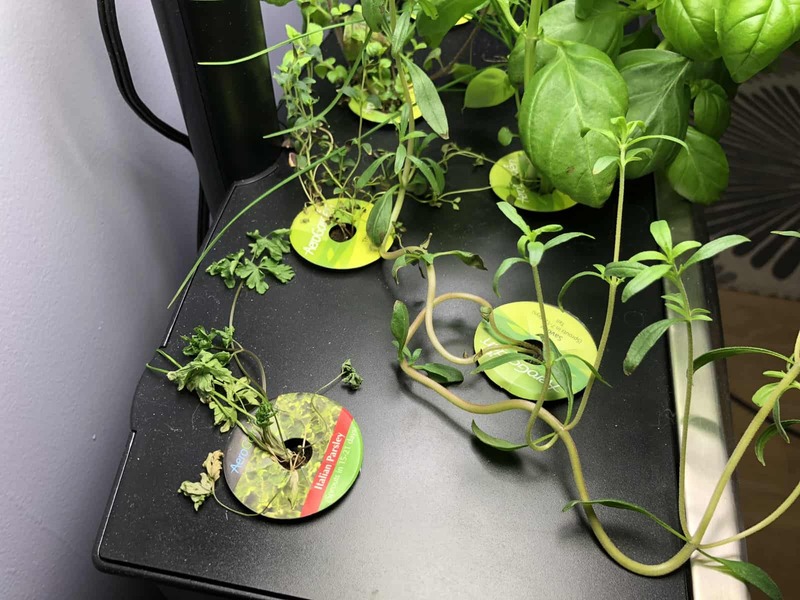 The oregano takes longer to sprout than the other plants, which as you’ll see is something I might change in the future. At this point was the first time I did any real maintenance aside from removing the caps. I added more water and a couple of doses of the included nutrients as recommended in the instructions. The instructions say to refill the water reservoir every 2-3 days, but I found this to be unnecessary at this stage. The water level just doesn’t drop that much in the first month or so. Surprisingly, at 25 days in the oregano still has the cap on. It was supposed to take longer than the other plants, but it’s really taking its sweet old time coming up. Meanwhile, the other plants are all starting to look like they should. This isn’t really obvious from the pictures, but I think the plants on the back corners get less light and underperformed as a result. There’s also a fair bit of strategy to the placement of the different pods and I didn’t give this much thought initially. Once the roots started really reaching into the reservoir, I was afraid to move the pods around in the tray. Ka-pow! The basil really took off, in such a way that I was slightly afraid for all the other plants. 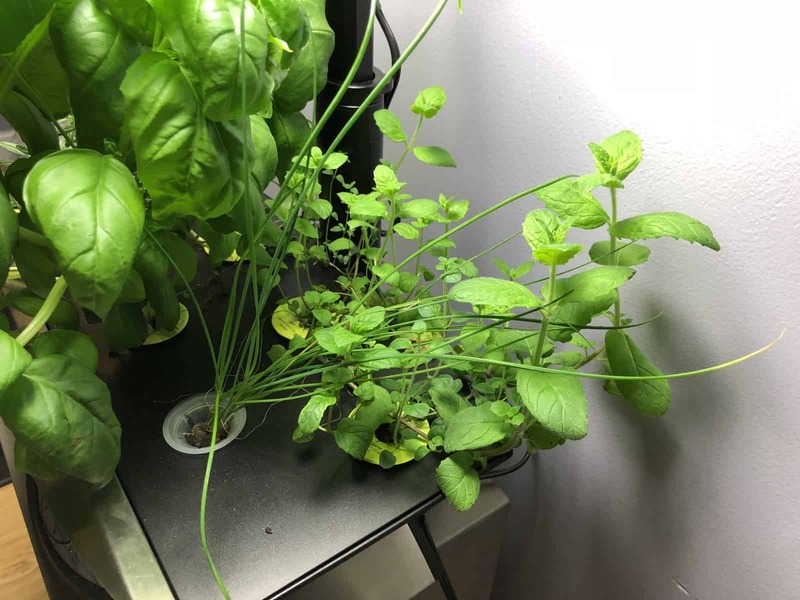 The poor oregano just finally got its pod cap removed and the basil is already looking like a small tree by comparison. I’m seeing some other odd growth patterns as a result and it seems pretty clear to me at this point that the position in the tray and how you arrange the herbs in it is a major factor in allowing everything to grow properly. If I had it to do all over again, I would probably give that position to a plant that needs more time to develop. At about a month and a half in, I can really see the problems developing from my inexperience, but some weren’t as bad as they look. The Italian parsley has one brown leaf and it’s starting to list toward the back. I didn’t know if it would form at all after that weird, moldy start but it did get this far. Unfortunately, it didn’t really get any farther than this. This was about the peak for the parsley and it started going downhill after this. 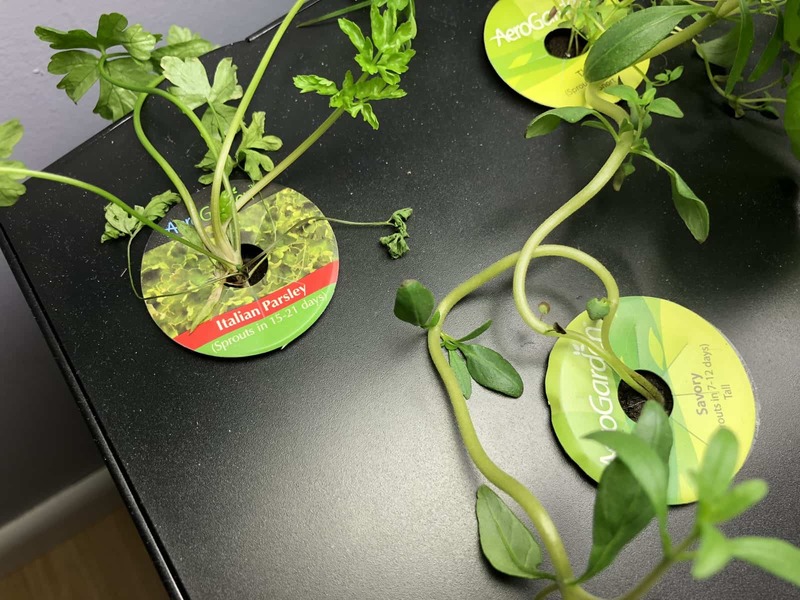 You can also see that the savory is growing flat against the tray and has stems that are very thin close to the growing pod. I wasn’t sure if this plant would make it either. The basil continues to be a monster and the oregano continues to form but it’s growing straight toward the back, presumably to get away from the basil. As you can see, the parsley is now basically dead. The thyme next to it in the back row is also growing slowly. 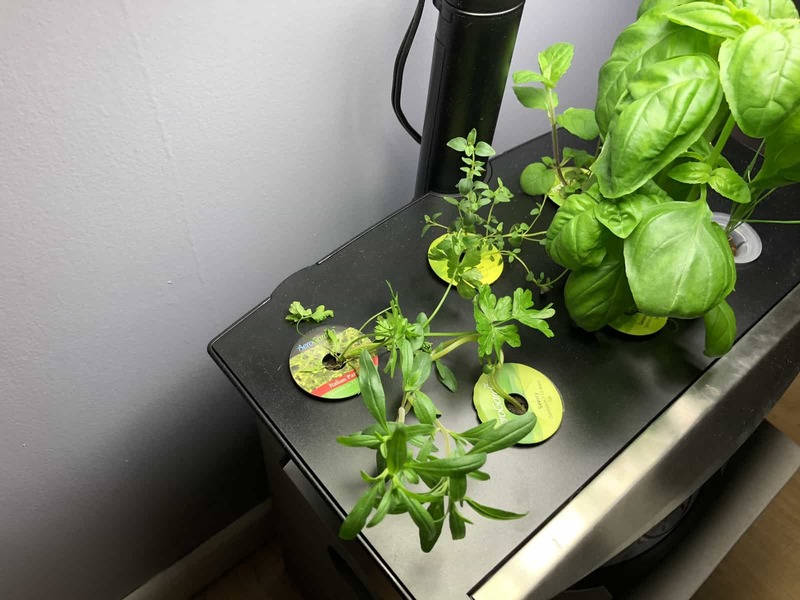 When I grow thyme in pots outdoors it seems to be very robust, so I’m pretty sure this is a function of how I set up the pods and the proximity to the monstrous basil plant, which is now growing down the front of the AeroGarden. A quick note about the height of the lights. The lights are designed to extend to a considerable height of two feet but it’s easy to forget to move them. 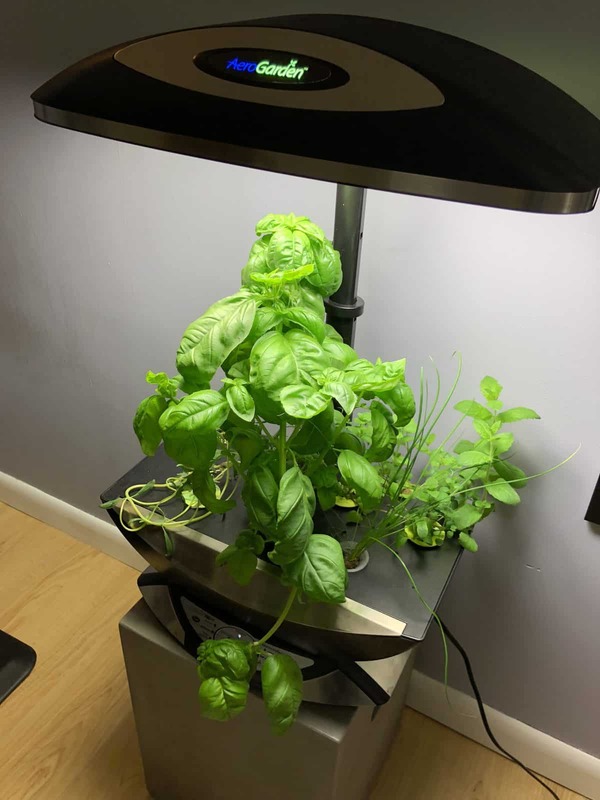 That basil plant grew so aggressively that one day I noticed the top leaves were actually touching the light bulbs and were burned as a result (another benefit of LED lights is that burning would be less likely). So just remember to stay on top of moving the lights. 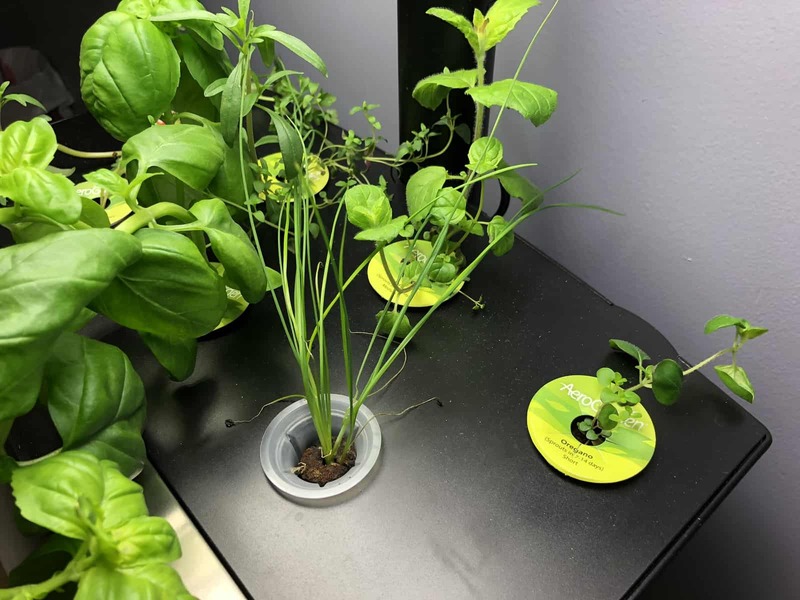 If the AeroGarden were roughly at eye height this would also have been more obvious. At this height, it was hiding under the lid from my vantage point. 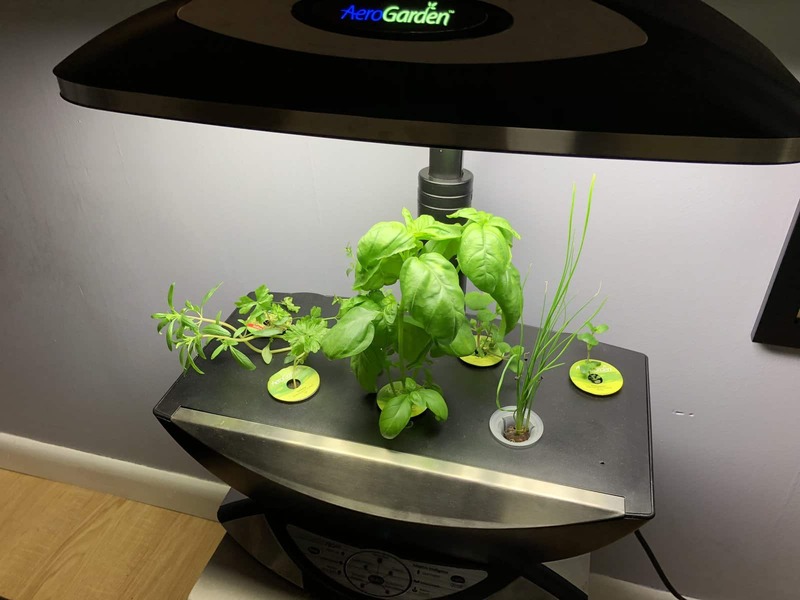 About two months in, we’re now getting herbs regularly and we’ve flavored a number of dinner dishes from this AeroGarden. My daughter also likes to pick and chew mint leaves right from the plant. As you can see from the images, most of the herbs lived and were productive. The parsley died but all the others did at least something. The thyme didn’t perish but it never grew that much and it will probably only be enough to flavor one meal, if that, when I harvest it. 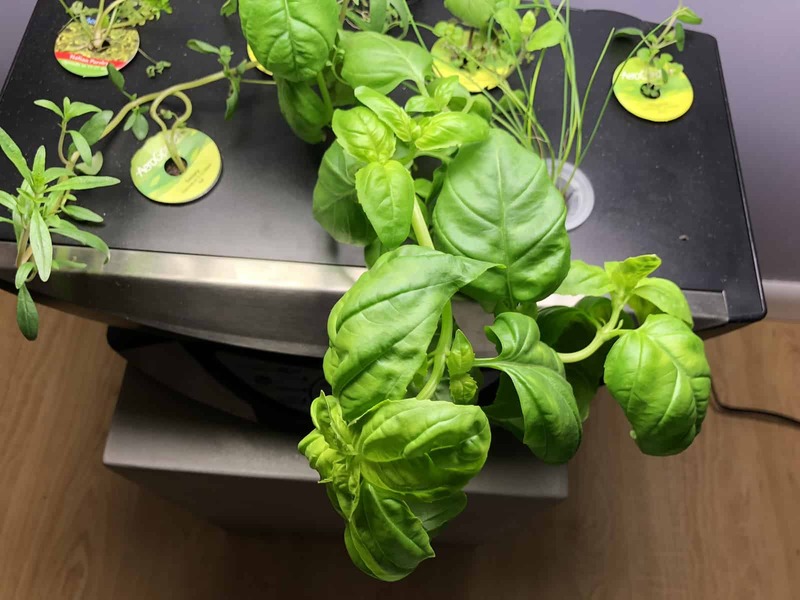 The savory eventually started growing upward and then over the side and back of the AeroGarden. So while the stems still look thin at the base, they are sturdy and it didn’t stop the plant from producing. The chives maxed out too early because the basil overshadowed them, but again, it was enough for a meal. Aside from the savory and the basil, the mint and oregano ended up being very productive. You don’t need a lot of oregano for most recipes, so the amount we eventually got was more than we can really use. It took a long time to develop, but that oregano plant was a winner. 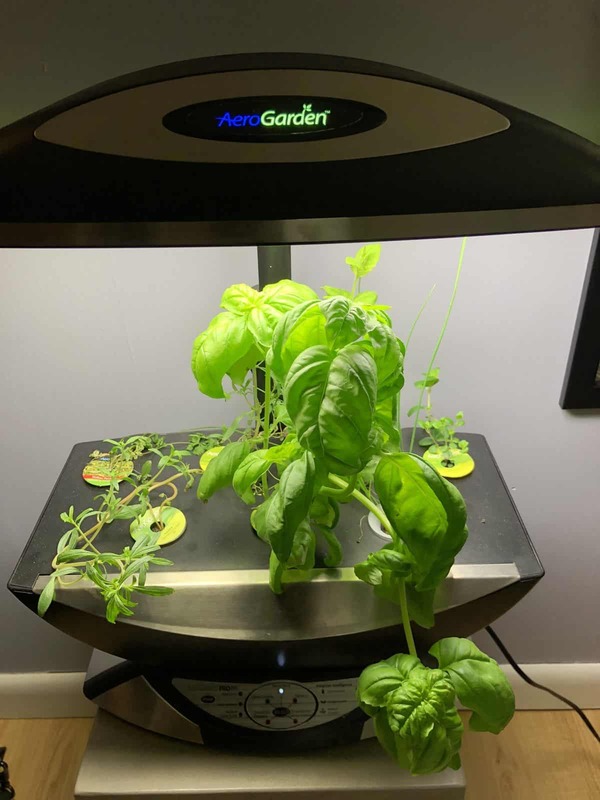 At about three months in we are still harvesting basil, savory, and mint from the AeroGarden. The mint has stems that are nearly as thick as your pinky finger and about as sturdy. I couldn’t have grown it any better outdoors. 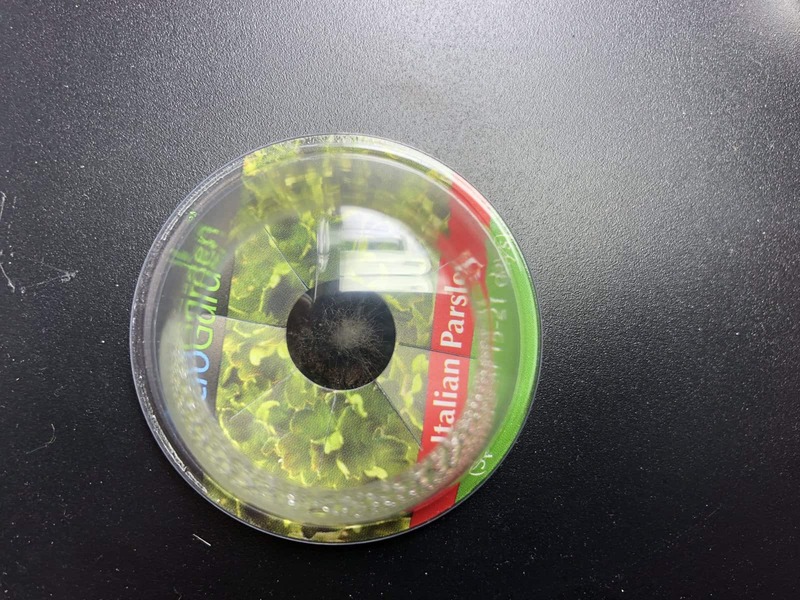 There are just a couple main considerations with choosing an AeroGarden model. They all have the same basic hydroponic technology under the hood but they differ in size and features. If you’re tight on space, this 3-pod model may be just the ticket. I think it’s the sleekest and best-looking model overall, especially from the front. It has LED lighting and the same basic functions as the one I reviewed above. It has the same physical button menu, which I think is fine because you don’t often have to make any changes to it. The form factor is long and narrow, so you could easily fit several of them side by side if you wanted to. 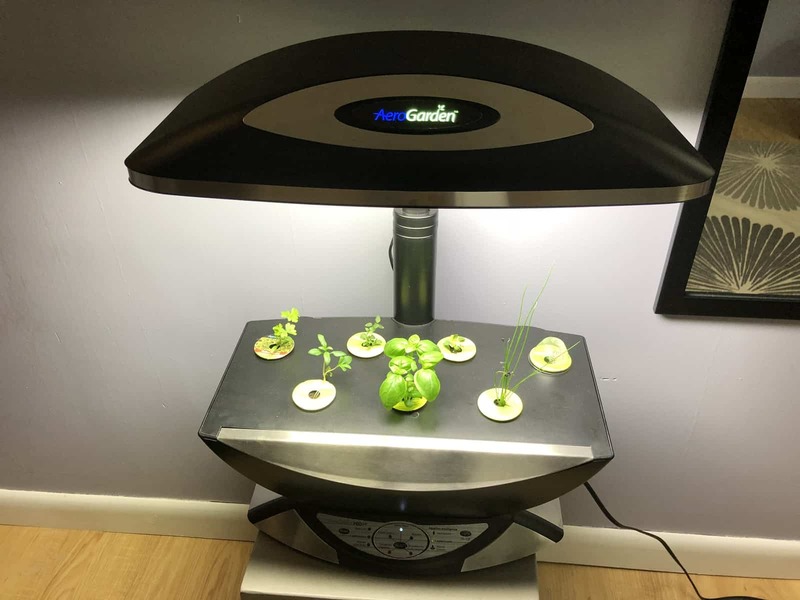 The AeroGarden Harvest is the mid-sized model, which is the closest one they make to the model I reviewed above. It is a 6-pod unit with LED lighting and a small screen with four buttons that you use to make changes. I personally think that the Harvest is the unit that most people will want. It’s a great blend of size and features that will appeal to the common user. You can get a larger model and you can definitely get a lot more features, but I’m not sure you really need them. It’s also priced in a way that gives it the highest productivity per dollar. The AeroGarden Bounty is the Cadillac of the AeroGarden lineup. A 9-pod tray gives it 50% more growing space than the Harvest, and a touchscreen control panel makes it the high-tech option without a doubt. There are models above this as well, the Elite Platinum and the Elite Platinum with WiFi that syncs to an app on your smartphone. Here’s the thing though, the reason the smaller models only have a few physical buttons is that there really aren’t that many changes to make. And the more technology you add, I would expect to make even fewer changes. More technology means more potential points of failure, and sure enough, these fancier models get lower customer reviews because they break more often. So unless you just have to have the best of everything, I don’t think this is the best model to buy. You can actually buy TWO of the Harvest models for roughly the same price as the Bounty, and you’d end up with 3 more pods to grow more produce. I think 99% of people should skip the Bounty and go with one (or more) of the Harvest models. 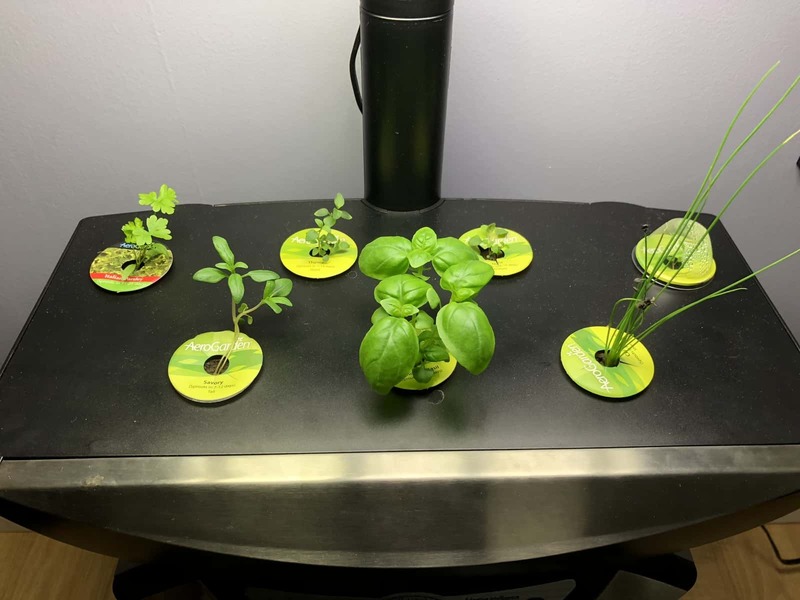 As I said, my kids loved helping out with my AeroGarden. They were always looking inside, trying to see what was going on, and tending to the plants. The Herbie Kid’s Garden just makes this activity easier. 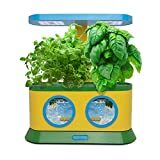 It’s a two-pod AeroGarden with a colorful exterior and two portholes so the kids can easily see inside. The 12-week growing process culminates in a pizza party so the kids can use the herbs they’ve grown. It’s a great idea and priced to make it a good birthday or holiday gift. All in all, I really enjoyed this experiment and so did my kids. 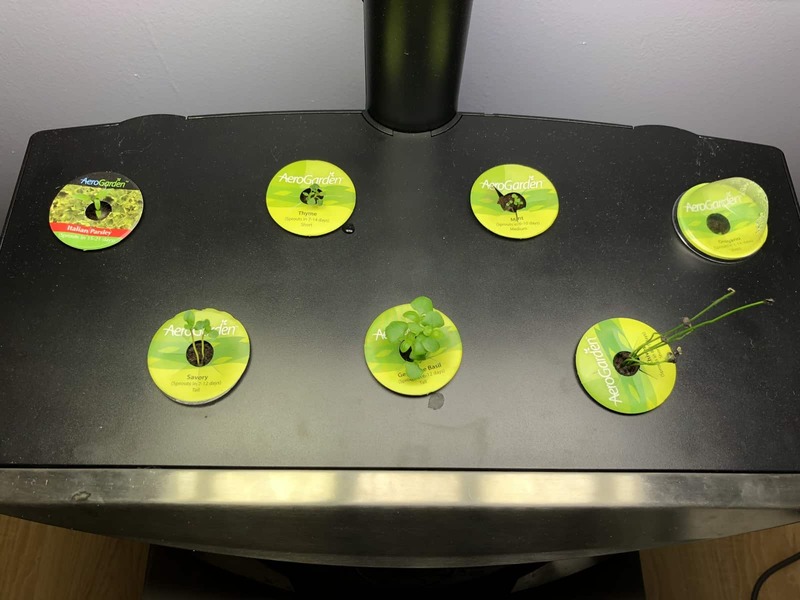 I’ll soon replant the AeroGarden with new pods and I’ll do a much better job of choosing and placing them this time. The herbs added a much-needed dose of life, greenery, and fantastic scents to my home office. 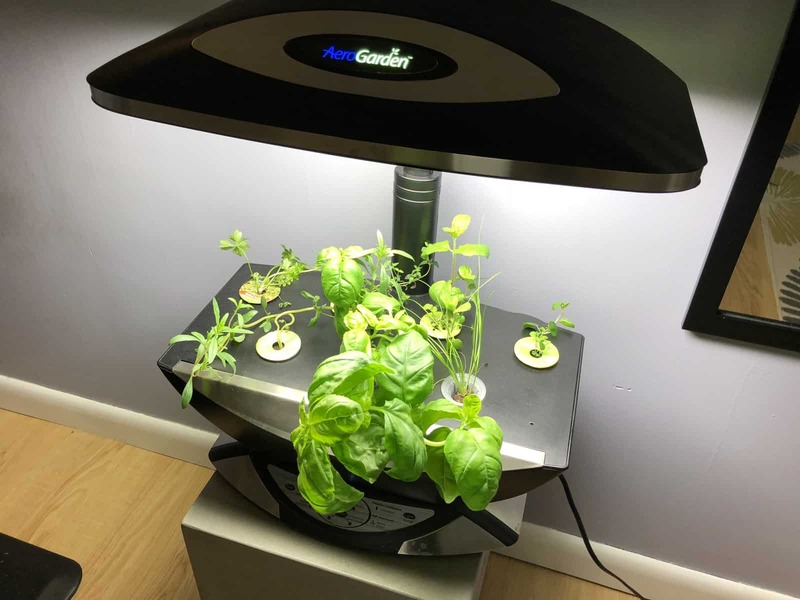 If you’re looking to take your gardening indoors, I think an AeroGarden is a very easy option for doing so. 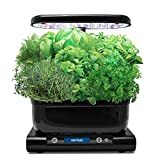 Have you tried an AeroGarden? What did you think? Let us know in the comments below!